On November 10, 2012 at approximately 6:30 p.m., Jesus Mondragon, 34, was driving his SUV. He had four passengers with him at the time, when he reportedly ran a stop sign at the intersection of NC 131 and Silver Spoon Road. According to news reports, he hit another vehicle being driven by Hannah Worley, 20. None of the six people involved in this crash were reported to be wearing seat belts. Two young children in the back of Mondragon’s SUV were ejected during the collision and killed. They were Samantha Mondragon, 11, and Ashley Mondragon, 2. Investigators said that they believe their lives would have been saved if they had been properly restrained. North Carolina Highway Patrol Sgt. John M. Lewis determined that speed was not a factor. He said that the Mondragon SUV was traveling at about 55 miles per hour when it ran the stop sign and hit the other vehicle on NC 131 that had the right of way. Sgt. Lewis went on to say that, “It’s the parent’s responsibility or their guardian or that person operating the vehicle to make sure that everyone is restrained. For children to be as innocent as they are, most just don’t know better. If they don’t practice it themselves, then these are the outcomes.” In this case, the impact of this collision and the reportedly forgotten seat belts will be with this family forever. Statistics reveal that over half of the car crash fatalities involved people who were unrestrained. Without a doubt, wearing a seat belt is the single most effective way to survive a serious accident and usage is increasing across the country. Enforcement laws have resulted in increased usage of seat belts. Most states, including North Carolina, have what are called primary enforcement seat belt laws. Primary enforcement laws allow an officer to pull you over and give you a ticket for not being belted or for having unbelted passengers. Secondary enforcement states only allow officers to issue a citation for a seat belt violation if you have been pulled over for some other reason. Statistics don’t lie! Don’t be in too much of a hurry or simply forget to make sure you and all of your passengers are securely belted. Having your seat belts on can protect you and your loved ones from needless injuries or death. Remember, the chances of survival after being ejected from a vehicle are slim. 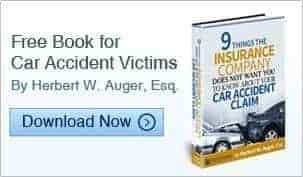 If you or someone you know have suffered injuries of lost a loved one in a tragic car crash, you need to seek the advice of an experienced car accident attorney in North Carolina. Auger & Auger has been experienced for nearly 40 years in representing the people of North Carolina involved in tragic car accidents. Our attorneys and caring staff can guide you every step of the way through this difficult time. Contact us through our website or call our toll free number at (800) 559-5741 to schedule your no obligation consultation. Our firm has five offices. Three are conveniently located in Charlotte and we have an office in Raleigh and Greensboro.We handle cases on a contingency basis so that you will never owe us a fee unless we make a recovery for you. In October 2012, six North Carolina state lawmakers visited Texas in a continuing effort to understand the issues that we will face when fracking begins here. In the summer of 2012, the legislature narrowly voted to allow fracking in North Carolina. It is reported that there is a concentration of some 1.7 trillion cubic feet of natural gas in or around Lee, Moore and Chatham counties. “Fracking” is an industry slang term meaning hydraulic fracturing. This is a method whereby natural gas is forced out from shale formations by using pressurized water and chemicals to fracture the rock. This allows for more gas or oil to be extracted from the site. Although fracking was first used in 1947, modern day fracking became prominent after the Barnett Shale find in Texas in 1998. The massive Eagle Ford Shale Region in Texas runs from the Mexico border to just south of San Antonio and is said to contain trillions of cubic feet of natural gas. Touring this region by the six lawmakers revealed the good and the bad. The economic boom in the area has been tremendous, since it first began in 2008. Jobs became plentiful. Construction is rampant to accommodate the housing needs of the influx of workers coming into the area. Businesses are thriving because of the spending habits of the workers and their families, including banks, restaurants and other local businesses. With all of the economic blessings, sleepy South Texas towns are now seeing continuous traffic and congestion. The narrow country roads and highways are being torn up from the weight and continuous usage by 18-wheelers hauling oil field equipment and supplies. With this continuous traffic, torn up roadways and fatigued drivers, the Eagle Ford Shale area has become very dangerous. Traffic accidents and fatalities have risen dramatically over the years, from 2008 to 2012. Whether you or someone you know have suffered serious injuries in a car accident or an 18-wheeler accident, you need to talk to a North Carolina lawyer who is experienced in handling truck accidents and other personal injury cases. Auger & Auger is a Charlotte, North Carolina personal injury law firm with almost 40 years of combined experience in handling cases for clients throughout the state. We have a total of five offices. Three are located in Charlotte and two are located in Raleigh and Greensboro. Contact us to schedule your free consultation at an office convenient to you. We handle cases on a contingency basis, so that you will never owe us a fee unless we make a recovery for you. Asheboro Police were called out on Halloween night to investigate an accident involving three vehicles. Two vehicles, which were dropping off trick-or-treaters, were stopped on the road with their flashers on. A 2001 Mitsubishi being driven by Michael Aaron Jenkins, 21, reportedly crashed into the rear of a 2008 Nissan, which was shoved into a 1995 Nissan as a result of the collision. Four people were hurt. Fortunately, six trick-or-treaters had already gotten out of the cars and were uninjured. The investigating officers stated that the crash occurred at roughly 8:30 p.m. on Old Castle Road close to Buckhorn Drive in Asheboro. The identities of the four injured victims were not released. However, they were transported by ambulance to Randolph Hospital for examination, treatment and later released. Police charged Michael Jenkins with driving while intoxicated (DWI), driving with a revoked license and failure to slow down to avoid the accident, in addition to careless and reckless driving. Their investigation revealed that he was driving around 70 miles per hour in a 35 mile per hour speed zone. His reported estimated speed at the time of impact was said to be around 50 miles per hour. Under the alleged circumstances, it was remarkable that the crash didn’t result in more severe injuries or fatalities. Jenkins’ vehicle was also seized by police because he was reported to be driving with a revoked license. His license had reportedly been suspended in 2008 because of another DWI. North Carolina has zero tolerance for anyone under the age of 21 driving after drinking, regardless of their blood alcohol content (BAC). For anyone over the age of 21, any BAC in excess of .08 will result in a DWI. For commercial drivers, the allowable BAC is even lower at .04. Nearly 30 people die every day in alcohol related accidents. This is roughly one fatality every 48 minutes. In 2010 alone, there were 10,228 people killed in alcohol related accidents, accounting for 31% of all traffic fatalities in the United States. Make no doubt about it, drinking and driving is a deadly mix. Not only can it change forever the lives of the victims who suffer catastrophic injuries but it can be a life changing event for the driver, as well. If you or someone you know has suffered catastrophic injuries or the loss of loved ones because of a drunk driver, you need to seek the advice of an experienced North Carolina car accident attorney. Auger & Auger is a Charlotte based personal injury law firm with offices in Raleigh and Greensboro. Our attorneys have nearly 40 years of combined experience representing clients throughout the state in serious injury and wrongful death cases. Along with our experienced staff, we will guide you every step of the way through this emotional process. Contact us online through our website or call our toll free number at (800) 559-5741 to schedule an appointment for your no obligation consultation. . Our firm handles cases on a contingency basis. This means that you will owe us a fee only if we make a recovery for you. Our North Carolina personal injury lawyers have been watching the Jessica Tata case in Houston, Texas with much interest. It is yet another reminder of the tragedies that can result from day care injuries. Sadly, the case involves the deaths of four children who were left in her care while their parents went to work in February 2011. The trial of Jessica Tata, 24, began with opening statements from attorneys at the Harris County Criminal Courthouse on October 24, 2012. She is accused of murder in the deaths of four deceased children who were in her care at her Houston day care center. Tata has been accused of leaving the children unattended while she went shopping at Target. While she was away, a fire allegedly started when a frying pan with oil in it was left on the stove and ignited. The blaze reportedly caused the deaths of four children and resulted in severe injuries to three others. The ages of the seven children at her daycare ranged from sixteen months to three years old. Tata, who was born in the United States, reportedly fled to Nigeria after the blaze, where she has citizenship. After being returned to the states in March 2011, she has been in jail on bonds exceeding $1.1 million. She faces four felony murder counts, in addition to three counts of child abandonment and two counts of reckless injury to a child. Following the incident, state lawmakers enacted changes in the oversight of day care facilities. However, Texas, like many other states, is lagging behind in training requirements, background checks and inspection standards for home day care operations. According to the North Carolina Child Care Resource & Referral Council, North Carolina ranked 19th in child care center licensing and oversight and 14th in family child care home licensing and oversight, among all states. Child care centers are typically larger facilities, having more experienced employees and the capacity for more children. Family child care homes are smaller day care facilities operating out of someone’s home, with fewer children. No parent should ever have to ever have to face the decision Tiffany Dickerson did on February 24, 2011. She is the mother of two children who were left in the care of Jessica Tata that day. When she was notified of the tragedy, her choices were to go see her severely burned daughter in the hospital or going to the morgue to see her son. If you or someone you know has had to face any tragedy caused by the neglect of a worker of a day care facility, it is important that you contact a North Carolina personal injury lawyer experienced in handling day care accidents and a proven record. Auger & Auger is a Charlotte, North Carolina law firm experienced in helping people like you with their personal injury cases. We have five conveniently located offices, three in Charlotte and one each in Raleigh and Greensboro. Contact us for your no obligation consultation. All cases are handled on a contingency basis so that you will never owe us a fee unless we make a recovery for you.